Leadership is the primary expectancy from a manager. It simply means accepting responsibility. There are certain qualities that are regarded essential for a strong leader. They are: Adapting to change, Decision making, Maintaining open lines of communication and leading others to the completion of goals. Leadership when defined will give us a better understanding. It is commonly defined by management theorists as “the process of influencing the activities of an individual or a group in efforts towards goal achievement in a given situation”. Leadership is not just limited to management, it is widely accepted that most successful organizations have strong and effective leaders. Leadership style is the approach which leaders adopt and reflect in their roles, rather the way in which authority is used. The amount of authority retained and the decisions made play a vital role in determining the leadership style. Leadership style encourages and promotes employee involvement planning, problem-solving and decision making. But some seem to confine employee involvement in these areas. We can say that it influences the human resources usage. It evinces control especially when relating to people. Because, when the leadership style adopted is more authoritative, the more the leader or manager separates himself from the people. In that case, the leader will only be able to use people’s muscles and not their minds. The type of communication that develops between the leader and the workforce is controlled by the leadership style. The amount of authority shared between the top management and the workforce helps in determining the type of leadership style that is being used. 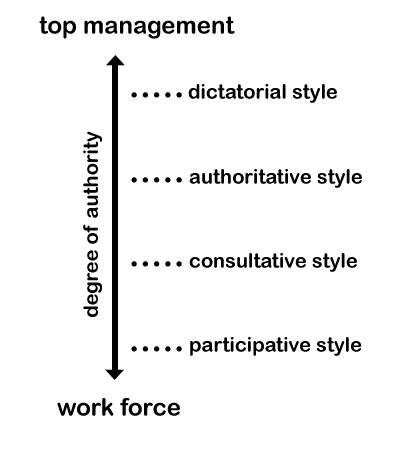 As the name suggests the manager or leader using this style of leadership will function like a dictator. The manager would take supreme power in decision making concerning what, when, where and how things are done and who will carryout them. People failing to carry out their duties will certainly be taken to task. Authoritarian leaders are also known as autocratic leaders. They provide their expectations very clearly as in what needs to be done and how. But researches show a lack in creativity in an authoritarian leadership, as the authoritarian leader makes decisions independently with little or no inputs from the group. The detrimental aspects of this leadership style viewed are being bossy, dictatorial and controlling to the core. This leadership style can be used at its best in situations when there is very little time for group decision making or when the leader is the only knowledgeable member of the group. Consultative leadership is basically task oriented and always focuses on the end result by using the skills of others in formulating plans and taking decisions. But then the final decision making power is always retained with the leader. But still, that final decision is not arrived at without looking for inputs from the members who will be affected by the decision. The consultative leadership stands out through its attempt to involve people who have problems in seeking ideas for the solution. This way, it helps those to develop leadership and decision making ability in them. Team building is a prime target in Consultative leadership. In this type of leadership style all the members of the team are involved to identify the vital goals and develop procedures and strategies to reach those goals. Analysing from this perspective, participative team leadership can be viewed as a style that depends on the leader functioning as a facilitator and not a dictator to issue orders and get things done. Participative leadership in its most effective form will let the talents and potential skills of the team members to be made the best use of particularly when arriving at decisions and taking the right course of action. The final decision will always be taken by the leader but then this sharing of functions within the team will supply the perfect atmosphere for every member in the team to provide inputs that are worth enough to make the final decision, which would be ultimately profitable for the organization as a whole. good explaination but lacks detailed information. Thanks for finally talking about >LEADERSHIP STYLES | Communication Theory <Liked it! i apreciated this article because it is important to kwon this stiles of leadership.